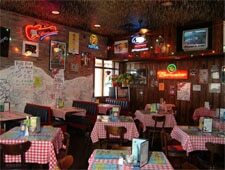 In the heart of the bustling entertainment district, Huey’s downtown location offers burgers and other pub grub. : Across from the historic Peabody Memphis hotel and close to Beale Street, the downtown Huey’s is ideal for tourists seeking a quick lunch. But it’s also a hot spot for downtown office workers --- for lunch and after-hours cocktails. Huey’s serves up juicy beef patties with a choice of fixin’s (West Coast-style with Monterey Jack and guacamole, the Señor Huey with jalapeños, patty melt-style, or on Texas toast with grilled onions). Two veggie burgers --- a vegan vegetable patty and a vegetarian black bean patty --- would fool even the most diehard carnivore. Heart-healthy options include a grilled tuna sandwich and a low-fat burger on a whole-wheat bun with a side salad in place of steak fries or onion rings. Not in the mood for a sandwich? Steak and chicken kebabs and chili-topped tamales make savory options. Desserts include lemon icebox pie and "The Rockslide" brownie sundae (a brownie topped with caramel ice cream and brownie crumbles). Wine offerings aren’t particularly impressive, but Huey’s does boast a full bar. Local jazz and rock bands bring free shows on Sunday afternoons. The atmosphere is flip-flops casual (think booths, checked tablecloths, local memorabilia). The walls and booths are covered with Sharpie graffiti, and the ceiling is filled with toothpicks that have been blown through straws by customers. Other locations.